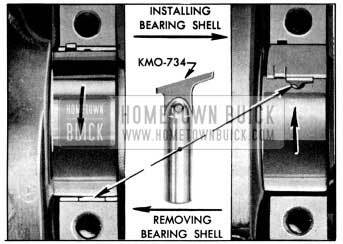 A 1956 Buick connecting rod bearing consists of two halves or shells which are alike and interchangeable in rod and cap. When the shells are placed in rod and cap the ends extend slightly beyond the parting surfaces so that when rod bolts are tightened the shells will be clamped tightly in place to insure positive seating and to prevent turning. The ends of shells must never be filed flush with parting surface of rod or cap. Use an outside micrometer to check crankpins for out-of-round. If crankpins are more than .0015″ out-of-round, satisfactory life of new bearings cannot be expected. Service bearings are furnished in standard size and several undersizes (including undersizes for reground crankpins). Remove connecting rod cap with bearing shell. Wipe oil from bearing and crankpin journal, also blow oil out of hole in crankshaft. NOTE: Plastigage is soluble in oil. 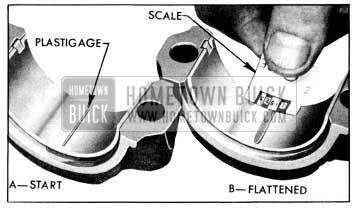 Place a piece of Plastigage lengthwise along the bottom center of the lower bearing shell (fig. 2-27, view A), then install cap with shell and tighten bolt nuts to 40-45 ft. lbs. torque. NOTE: The rib on edge of cap and the conical boss on web of rod must be toward rear of engine on all rods in right bank or toward front of engine in left bank. Remove bearing cap with bearing shell, the t1attened Plastigage will be found adhering to either the bearing shell or the crankpin. Do nor; remove it. Using the scale printed on the Plastigage envelope, measure the flattened Plastigage at its widest point. The number within the graduation which most closely corresponds to the width of Plastigage indicates the bearing clearance in thousandths of an inch. See figure 2-27, view B. The desired clearance with a new bearing is .0002″ to .0023″. If bearing has been in service it is advisable to install a new bearing if the clearance exceeds .003″; however, if bearing is in good condition and is not being checked because of bearing noise, it is not necessary to replace the bearing. After the proper size bearing has been selected, clean off the Plastigage, oil the bearing thoroughly, reinstall cap with bearing shell and tighten bolt nuts to 40-45 ft. lbs. torque. See NOTE in step 2. 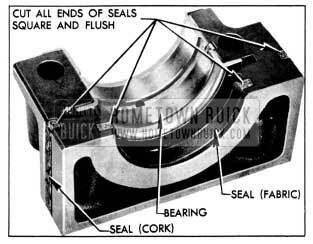 A 1956 Buick crankshaft bearing consists of two halves or shells which are alike and interchangeable in cap and crankcase. The first four bearings are identical, but the rear bearing is longer and flanged to take crankshaft end thrust. When the shells are placed in crankcase and bearing cap the ends extend slightly beyond the parting surfaces so that when cap bolts are tightened the shells will be clamped tightly in place to insure positive seating, and to prevent turning. The ends of shells must never be filed flush with parting surface of crankcase or bearing cap. Crankshaft bearings are the precision type which do not require reaming to size or other fitting. Shims are not provided for adjustment since worn bearings are readily replaced with new bearings of proper size. Bearings for service replacement are furnished in standard size and several undersizes. Under no circumstances should crankshaft bearing caps be filed to adjust for wear in old bearings. Since any service condition which affects the crankshaft bearings may also affect the connecting rod bearings, it is advisable to inspect connecting rod bearings first (par. 2-17). If crankpins are worn to the extent that crankshaft should be replaced or reground, replacement of crankshaft bearings only will not be satisfactory. If condition of lower bearing shell and crankshaft journal is satisfactory, check the bearing clearance with Plastigage as described for connecting rod bearings in paragraph 2-17. When checking a crankshaft bearing with Plastigage, turn crankshaft so that oil hole is up to avoid dripping of oil on Plastigage. Place paper shims in lower halves of adjacent bearings and tighten cap bolts to take the weight of crankshaft off the lower shell of bearing being checked. NOTE: Arrow on cap must point to front of engine. If bearing clearance exceeds .0036″, it is advisable to install a new bearing; however, if bearing is in good condition and is not being checked because of bearing noise, it is not necessary to replace the bearing. Loosen all 1956 Buick crankshaft bearing cap bolts 1/2 turn, and remove cap of bearing to be replaced. Remove upper bearing shell by inserting Bearing Shell Remover and Installer KM0-734 in oil hole in crankshaft, then slowly turning crankshaft so that the tool rotates the shell out of place by pushing against the end without the tang. See figure 2-28. CAUTION: When turning crankshaft with rear b earing cap removed hold oil seal to prevent it from rotating out of position in crankcase. The crankshaft journal cannot be measured with an outside micrometer when shaft is in place; however, when upper bearing shell is removed the journal may be checked for out-of-round by using a special crankshaft caliper and inside micrometer. The caliper should not be applied to journal in line with the oil hole. If crankshaft journal is more than .0015″ out-of-round, the crankshaft should be replaced since the full mileage cannot be expected from bearings used with an excessively out-of-round crankshaft. Before installation of bearing shells make sure that crankshaft journal and the bearing seats in crankcase and cap are thoroughly cleaned. Coat inside surface of upper bearing shell with engine oil and place shell against crankshaft journal so that tang on shell will engage notch in crankcase when shell is rotated into place. Rotate bearing shell into place as far as possible by hand, then insert Installer KM0-734 in crankshaft oil hole and rotate crankshaft to push shell into place. CAUTION: Bearing shell should move into place with very little pressure. If heavy pressure is required, shell was not started squarely and will be distorted if forced into place. Place lower bearing shell in bearing cap, then check clearance with Plastigage as previously described. The desired clearance with a new bearing is .0005″ to .0025″. If this clearance cannot be obtained with a standard size bearing, insert an undersize bearing and check again with Plastigage. NOTE: Each undersize shell has a number stamped on outer surface on or near the tang to indicate amount of undersize. When the proper size bearing has been selected, clean out all Plastigage, oil the lower shell and reinstall bearing cap. Tighten cap bolts to 100-110 ft. lbs. The crankshaft should turn freely at flywheel rim; however, a very slight drag is permissible if an undersize bearing is used. After bearing is installed and tested, loosen all bearing cap bolts lf2 turn and continue with other bearings. When bearings have been installed and tested, tighten all bearing cap bolts to 100-110 ft. lbs. torque. Braided fabric seals are pressed into grooves formed in crankcase and rear bearing cap to rear of the oil collecting groove, to seal against leakage of oil around the crankshaft. Cork seals are cemented into grooves in the sides of bearing cap to seal against leakage in the joints between cap and crankcase. See figure 2-29. The braided fabric seal can be installed in crankcase only when crankshaft is removed; however, the seal can be replaced in cap whenever cap is removed. Remove old seal and place new seal in groove with both ends projecting above parting surface of cap. Force seal into groove by rubbing down with hammer handle or smooth stick until seal projects above the groove not more than 1/16″. Cut ends of flush with surface of cap, using sharp knife or razor blade. See figure 2-29. CAUTION: The engine must be operated at slow speed when first started after new braided seal is installed. Install oil pump, following procedure given in paragraph 2-24 to avoid .binding. Remove 1956 Buick cylinder heads (par. 2-14, a), lower crankcase and oil pump. 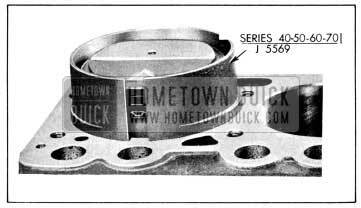 Examine the 1956 Buick cylinder bores above the ring travel. If bores are worn so that a shoulder or ridge exists at this point, remove ridges with a ridge reamer to avoid damaging rings or cracking ring lands in pistons during removal. Chamfering at 15 degrees angle will prevent ring damage when pistons are reinstalled. Use a silver pencil or quick drying paint to mark the cylinder number on all pistons, connecting rods and caps. Starting at front end of crankcase, the cylinders in right hand bank are numbered 1, 3, 5, 7 and in left bank are numbered 2, 4, 6, 8. With No. 1 crankpin straight down, remove the cap with bearing shell from No. 1 connecting rod, then install the short Connecting Rod Bolt Guide J 5239-1 on the lower connecting rod bolt, and install the long Guide J 5239-2 on the opposite bolt, above crankpin. Turn guides down to hold the bearing upper shell in place. See figure 2-30. Use the long guide to push the piston and rod assembly out of the cylinder, then remove guides and reinstall cap with bearing shell on rod. Remove all other piston and rod assemblies in the same manner. Remove compression rings using Ring Expander KM0-232. Then remove oil ring by removing the two rails, spacer, and expander which are separate pieces in each piston third groove. See Figure 2-35. 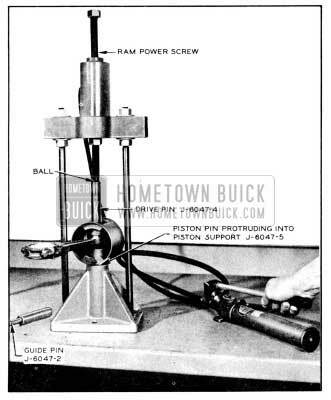 Place piston and rod assembly in press, see Figure 2-31. Using Piston Support J-6047-5 (with full radial face up) under the piston, place Drive Pin J-6047-4 in upper end of piston pin and press pin from rod and piston. Guide Pin J-6047-2 is not used during pin removal. See Figure 2-31. 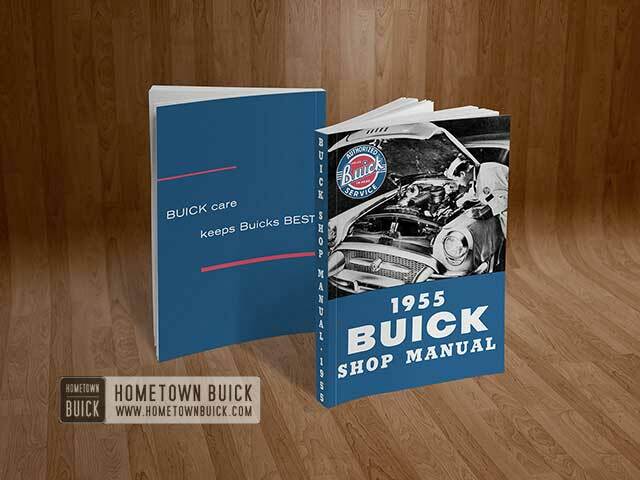 Inspect 1956 Buick cylinder walls for scoring, roughness, or ridges which indicate excessive wear. Check cylinder bores for taper and out-of-round with an accurate cylinder gauge at top, middle, and bottom of bore, both parallel and at right angles to center line of engine. The diameter of cylinder bore at any point may be measured with an inside micrometer, or by setting the cylinder gauge dial at “0” and measuring across the gauge contact points with outside micrometer while gauge is at the same “0” setting. Clean carbon from piston surfaces and under side of piston heads. Clean carbon from ring grooves with suitable tool and remove any gum or varnish from piston skirts with suitable solvent. The pistons are cam ground, which means that the diameter at a right angle to piston pin is greater than the diameter parallel to piston pin. 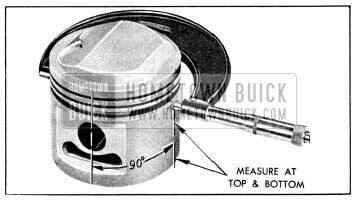 When a piston is checked for size it must be measured with a micrometer applied to skirt at points exactly 90 degrees to piston pin. See figure 2-32. If piston bosses are worn out of round or oversize, the piston and pin assembly must be replaced. Oversize pins are not practical with the pressed pin and rod assemblys. Piston pins must fit pistons with an easy finger push fit at 70° F. (.0003″-.0005″). 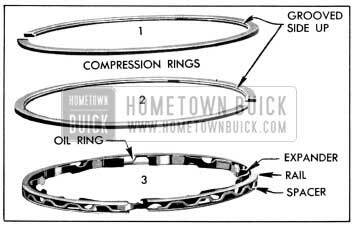 Examine all piston rings for scores, chips, or cracks, and for tension as compared with new rings. Place all compression rings in cylinder bores at lower end of ring travel and check gaps, which are normally .010″ to .020″. If gaps are excessive it indicates that rings have worn considerably and should be replaced. Before the honing or reboring operation is started, measure all new pistons with micrometer contacting at points exactly 90 degrees to piston pin (fig. 2-32) then select the smallest piston for the first fitting. The slight variation usually found between pistons in a set may provide for correction in case the first piston is fitted too free. When honing cylinders use clean sharp stones of proper grade for the amount of metal to be removed, in accordance with instructions of the hone manufacturer. Dull or dirty stones cut unevenly and generate excessive heat. When using coarse or medium grade stones use care to l eave sufficient metal so that all stone marks may be removed with the fine stones used for finishing to provide proper clearance. When finish honing, pass the hone through the entire length of cylinder at the rate of approximately 60 cycles per minute. This should produce the desired 45 degree cross hatch pat tern on cylinder walls which will insure maximum ring life and minimum oil consumption. Both the piston and the cylinder block must be at the same temperature of approximately 70° F. when the piston is checked for fit in cylinder bore; therefore, the cylinder should be allowed to cool after boring or honing and before the piston fit is checked. This is important because a difference of 10° F. between parts is sufficient to produce a variation of .0005″. Wipe piston and cylinder bore clean and dry. Make sure that the ribbon (1/2″ x 12″ x .003″) of Feeler and Scale J 5540 is free of dents or burrs, then place it on the lower side of bore, at a point 90 degrees to the normal piston pin location. 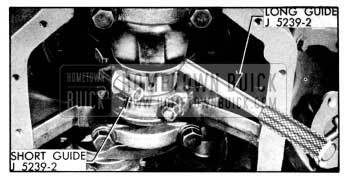 Install piston in bore with head downward and piston pin in its normal position parallel to the crankshaft. See figure 2-33. Hold the piston and slowly pull the scale in a straight line with the ribbon, noting the pull required to move the feeler ribbon at a steady speed. The pull will be between 7 and 13 pounds if the piston has the required clearance of .0014″ to .0020″. New piston rings must be checked for clearance in piston grooves and for gap in cylinder bores; however, the flexible oil rings are not checked for gap. The cylinder bores and piston grooves must be clean, dry and free of carbon and burrs. When fitting new rings to new pistons the side clearance of the compression rings should be .002″ to .004″ and side clearance of the oil ring should be .0035″ to .0095″. To check the gap of compression rings, place the ring in the cylinder in which it will be used, square it in the bore by tapping with the lower end of a piston, then measure the gap with feeler gauges. Piston rings should not have less than .010″ gap when placed in cylinder bores. If gap is less than .010″, file the ends of rings carefully with a smooth file to obtain proper gap. NOTE: Connecting rods may be sprung out of alignment in shipping or handling; therefore, they must be checked before pistons and pins are installed. Check bend and twist on an accurate rod aligning fixture using Guide Pin J-6047-2 (from wrist pin press) in place of wrist pin. Press V-block firmly and evenly against guide pin to prevent cocking pin in eye of rod which may be up to .002″ larger diameter than pin. To assemble piston, pin, and rod, first place Piston Support J-6047-5, Return Spring J-6047-3, and Guide Pin J-6047-2 in base plate of press. Use the piston support with the full radial face upward. See Figure 2-34. Place rod in piston, with oil spurt notch on same side as valve depressions in piston dome, lubricate piston pin and inside diameter of pin holes with Lubriplate. 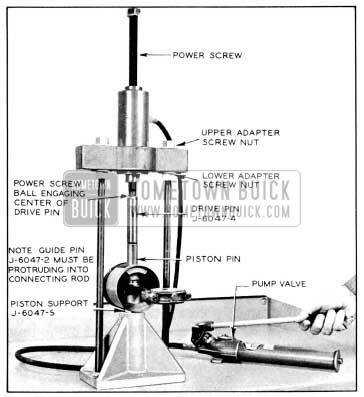 Insert pin into piston boss, pushing pin through to move rod over against opposite pin boss. Place small end of Drive Pin J-6047-4 in hold in upper (protruding) end of piston pin and position the assembly in the press. See Figure 2-34. Make certain that all units are in alignment, then apply pressure and force pin through rod and piston until Guide Pin J-6047-2 stops downward travel. Release pressure and remove piston and rod assembly from press. Rotate piston on pin to check on fit between piston and pin. Install oil ring expander in third groove of each piston, placing ends in area above either end of piston pin where groove is not slotted. Install oil ring over expander with gap on same side as valve depressions in piston head. NOTE: The rails and spacer of a new oil ring are lightly held together with an oil soluble cement. If parts have separated they may be installed as individual pieces. Install compression rings in second and first grooves of each piston, using Ring Expander KM0-232. Be sure to place the grooved or beveled side of each ring toward top of piston. See figure 2-35. Before installation of a piston and rod assembly in its cylinder bore, turn crankshaft to place the crankpin straight down. Remove cap, and with bearing upper shell seated in connecting rod, install the long Guide J 5239-2 on bolt which is on same side of rod as the oil spurt notch in the bearing parting surface. Install short Guide J 5239-1 on the other connecting rod bolt. These guides hold the upper bearing shell in place and protect the crankpin journal from damage during installation of connecting rod and piston assembly. Make sure that gap in oil rails are on same side as valve depressions in piston head so that gap will be on high side of cylinder bore, turn compression rings so that gaps are not in line, then compress all rings with Ring Compressor. See figure 2-36. 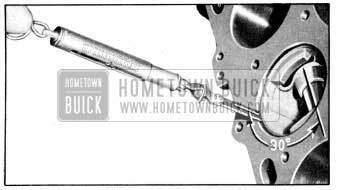 Insert piston and rod assembly into its cylinder bore with the long guide pin placed above the crankpin. Push the assembly down until the rod bearing seats on crankpin. See figure 2-31. Select new connecting rod bearing, if necessary, as described in paragraph 2-17. Otherwise, install cap with bearing lower shell on rod and tighten bolt nuts to 40-45 ft. lbs. torque. Install all other piston and rod assemblies in the same manner. When parts are properly installed, the valve clearance depressions in all piston heads and the oil spurt notches in all connecting rods will be toward the camshaft. The rib on edge of rod cap will be on same side as the conical boss on web of rod, and these marks will be toward the other connecting rod on the same crankpin. Check end clearance between connecting rods on each crankpin using feeler gauges. Clearance should be .005″-.012″. Install cylinder heads (par. 2-14, d) oil pump (par. 2-24) and lower crankcase.